Looking for worksheet practice that doesn't feel like a worksheet? 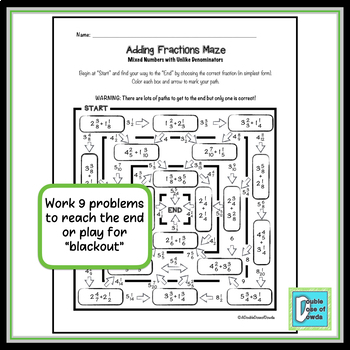 This is the fourth level of our Adding Fractions Maze Bundle. This unique activity allows students to practice adding mixed numbers with unlike denominators. This particular maze will require students to correctly complete 9 different problems to make it through the maze, although all 20 problems included in the maze have a correct answer listed. ♥ "Great for practice and a lot more fun than a regular worksheet as it made them think." ♥ "Kids LOVED this activity! Thank you so much." 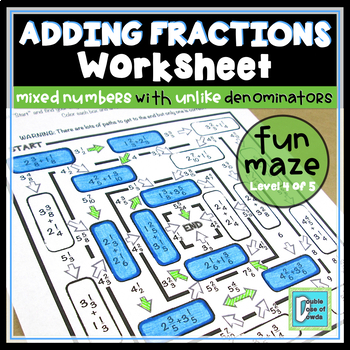 ♥ "This was great for differentiation in my classroom! My higher kids were excited to do this activity and challenge themselves!" ♥ "I did this as partner work where each partner has to solve the problem! They loved it!"